CHATRIUM CORDIALLY INVITES YOU TO THE WORLD’S BIGGEST PARTY! 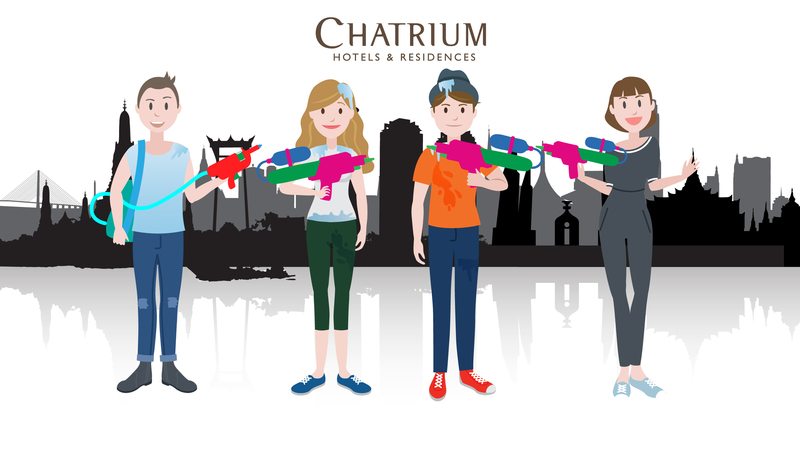 The annual Songkran Festival is fast approaching when everybody gets a chance to cool down in the summer heat with massive water battles and the biggest street parties known to man and with Chatrium Hotels and Residences Splash & Dash Deal@Chatrium we’ve got some cool package offers too! Experience luxurious riverside opulence at Chatrium Hotel Riverside Bangkok where we’ve got a special price for room only including free Wi-Fi and welcome fruit and drink, or why not spend your Songkran at Chatrium Residence Sathorn Bangkok with free Wi-Fi and a complimentary buffet breakfast to set you up for the day. The iconic Emporium Suites by Chatrium has Songkran all sewn up by offering a Songkran Survival Kit during the festival complete with water gun and waterproof bag and THB 300 credit per room for laundry and F & B while nearby Maitria Hotel Sukhumvit 18 also has its own Songkran Survival Kit as well as complimentary minibar soft drinks one time per stay. Meanwhile across the border in exotic Yangon you can enjoy a delightful set lunch menu one time per stay for two people and daily breakfast buffet at the majestic Chatrium Royal Lake Yangon. So why not celebrate the party of the year and truly Live the Remarkable at Songkran 2017 with an irresistible Splash & Dash Deal@ Chatrium. When the weather heats up they’re the coolest offers in town! Simply book online with the promo code SONGKRAN and enjoy your stay in Bangkok at Chatrium Hotel Riverside Bangkok, Chatrium Residence Sathon Bangkok, Emporium Suites by Chatrium and Maitria Hotel Sukhumvit 18 – A Chatrium Collection or in Yangon at Chatrium Hotel Royal Lake Yangon.